Green Lantern began airing on HBO recently, and I have to say that I’m somewhat appalled at just how bad it is—all the moreso because of the glimmers of how good it could have been. So, with Belated Media’s reimagining/rewriting of Episode I/the prequels as my inspiration, I’ve decided to offer some brief suggestions of ways to fix it. Note: This post will make little sense if you haven’t seen the movie. So, you know, feel free to skip it; it’s under the jump for a reason. Further note: I’m making this judgment and these suggestions based entirely on a single screening of the movie, the first 40 minutes of which I missed. “Oh, how can you judge a 1 hour, 45 minute movie if you missed the first 40 minutes?” I hear you snarking. I’ll tell you how: I turned it on exactly when Hal Jordan (Ryan Reynolds) first gets sent to Oa (the home world of the Green Lantern Corps). It takes 40. GD. Minutes. * To get to Oa. Forty! It doesn’t even matter what happened in the 40 minutes prior to that moment: They were almost certainly unnecessary. Anyway, what’s especially frustrating is the fact that there’s a good movie lurking somewhere here. You can feel loose strands of decent ideas wafting around, spun and then discarded or misplaced in one of the many drafts the picture went through. The one that jumps out at me is Sinestro’s decision to make a Yellow Ring powered by fear; the movie spends several minutes showing this for, apparently, no reason whatsoever as best as I can tell. No reason at all. He never uses the ring, no one ever mentions it again after its brief appearance: It just disappears. This being an action film, we need a high-octane sequence to kick things off: test pilot Hal Jordan shows he’s a badass while flying an experimental jet but does something to make the airplane crash, barely escaping with his life. “You’re too cocky!” his kinda-ladyfriend/kinda-boss Carol Ferris yells before hugging him to celebrate he’s alive. He stumbles over his words and she storms off in a huff. Hal goes off to brood. He loves her so much but is afraid to let his feelings known! Brooding Hal sees mysterious alien Abin Sur crashes, and, just before dying, Sur gives Hal his ring—which immediately transports him to Oa, where his physical bravery—but also his emotional unsteadiness—makes him intriguing to Sinestro, the greatest of the Lanterns. Here we embark on an extended training sequence—Sinestro serves as Hal’s Morpheus, teaching him how to use his ring and educating him on will, fear, and the Guardians of the Universe. (This might be the most important change I’d make: Instead of dismissive toward Hal, Sinestro should serve as a mentor.) He and a few other Lanterns (Kilowog, that bird-man, a new Lantern I’ll call Mousey Lantern) train Hal. During training, Sinestro relates the story of one guardian who thought he could tap fear and embarked on a quest to make a yellow ring—but fear corrupted him, and the Guardians banished him across the universe. “There are rumors that he has been freed,” Sinestro tells Hal. “Abin Sur was investigating them…but he never came back.” We also see just how much Hal is struggling with his feelings for Carol, possibly in a flashback, possibly in some sort of Danger Room-style simulation where a fake version of her is put at risk. Both would demonstrate Hal’s unbalanced emotions. Hal is sent home to finish his training—if he can’t patrol Earth/conquer his crippling emotional issues, he is no good to the Corps—while Sinestro tries to come up with a plan to stop the Yellow Fear Ball/Guardian, who has obviously escaped. He comes to the conclusion that the only way to battle fear is with fear, so he forges a new, Yellow ring. While patrolling Earth and trying to come to grips with his feelings for Carol, Hal receives warning that the YFB/Guardian is headed to consume Earth! 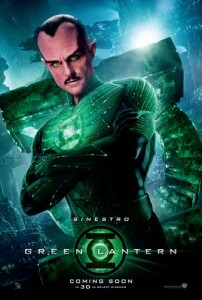 Sinestro is assembling a team to help Hal out, but he’ll be on his own until then. As the YFB/Guardian begins to destroy Century City, Hal defends the city, utilizing all the tricks he’s learned on Oa, but it’s not enough—he’s outgunned, cornered, about to die, and then BAM: A blast of yellow knocks down the YFB/Guardian. Sinestro has arrived with a squad of Lanterns … all of whom seem a little wary about their leader. A brief but intense battle takes place in which the YFB is driven from the corrupted Guardian. Thinking they will return the immortal Guardian to Oa for judgment/imprisonment, the Lanterns begin the journey home–only to have Sinestro, mad with power, execute him in cold blood. Now extremely worried about their leader, Hal, Kilowog, and others report Sinestro’s behavior to the Guardians, who meet and decide to strip Sinestro of his ring. Needless to say, Sinestro resists, wiping out the Guardians before deciding to head to Earth to take out the man who he feels betrayed him: His protege, Hal Jordan. Jordan, who has returned to Earth and is taking some personal time with Ferris, is surprised when Sinestro shows up and unsure if he can fight him—until his mentor threatens Ferris’ life. HERE is where Jordan purges himself of fear, telling Ferris how much he loves her, how much he needs her. No one ever doubted Jordan’s physical courage; it was the emotional baggage he needed to address. He’s now ready to assume his place in the Corps. Epic battle between Sinestro and Jordan follows; Jordan finally gains the upper hand and proves that will is more powerful than fear. Imprisoned, Sinestro’s headed back to Oa, guarded by Mouse Lantern…who Sinestro tricks into freeing him, killing Mouse and heading off into the universe/sequel. Hal, informed of this, sighs—but confidently. He knows that Sinestro isn’t going anywhere; the universe is only so big. He’s going to enjoy his time with Ferris until then. Bam. Tell me that’s not a better movie. You’ve stripped the plot of all the extraneous BS and refocused on what really matters: Hal, Sinestro, and Ferris. You’re also stripped the plot of all the extraneous relationships: Who cares if someone else loves Ferris or if that someone has daddy issues? These are the characters the movie needed to focus on. *I’m going to hedge here and say that maybe it was 30 minutes in; the more I think about it, the fuzzier my memory on the specific length gets. Either way, it’s way too long. **OK, actual synopsis of the last hour or so: Hal Jordan jets off to Oa, where he is introduced to the Green Lantern Corps and the Guardians of the Universe and it is explained to him that “green is the color of will” which powers the GL rings, while “yellow is the color of fear,” a force no GL can hope to master. While training, Sinestro derides Hal as unworthy of the Corps, and Hal, who is afraid, scurries home to Earth with his tail between his legs. Meanwhile, on Earth, Peter Sarsgaard has daddy issues and has been corrupted by a mutant strain of fear, or something, and lusts after Hal’s would-be girlfriend; he’s very distraught when Hal returns to Earth and is even awesomer than before. Off-Earth, Sinestro leads a team of Green Lanterns against a giant yellow ball of fear that used to be a Guardian who was corrupted in his attempt to tap fear as a weapon. All the GLs except for Sinestro are wiped out, and he asks permission from the Guardians to form a yellow ring with which he can combat the yellow fear ball. He does this, and then we never see that ring again because Hal comes back to Oa and is all like “Dudes, the yellow fear ball is headed toward Earth and I need your help to stop it!” Sinestro says “You’re on your own!” and he heads back to Earth, kills Saarsgard, saves his girlfriend, and throws the yellow fear ball into the sun. Sinestro realizes that Hal Jordan is awesome and says “Hal Jordan you are awesome.” The end. ***Think back to The Dark Knight and the confrontation in the abandoned building between Batman, Dent/Two Face, and Gordon. So much dramatic tension! We actually cared about the resolution! There was no giant blob of fear! And note: The movie ended with a confrontation between Batman and Two Face—who the audience has an emotional investment in—not Batman and the Joker, who is a fascinating character but not one we really care about, emotionally. Untrammeled id might be fascinating, but it’s hard to form a connection to it. I’m inordinately excited you decided to write this, probably because I’m in need of a venue where I can express just how much I loathed this film. I don’t know why – I’m not invested in the source material; I have no strong feelings about any of the actors involved; and I couldn’t care less about the director. I just thought the movie really, really sucked. So while I appreciate your efforts at script doctoring, I think the film suffers from a more fundamental problem. As far as I can tell, any Green Lantern is basically omnipotent as long as he – or she, or it – can muster enough willpower to conjure up an appropriate weapon or countermeasure. This begs the question: How can any movie establish dramatic tension if the protagonist is basically invincible? Cripes, even Superman had to worry about kryptonite. Beyond that (glaring) problem, I also can’t imagine how you depict the Green Lantern’s super powers in a way that doesn’t look unbearably cheesy. Imagining a race car track into existence out of green gas – excuse me, “will” – is always going to look stupid, no matter how much work you put into the characters’ back story. So, the joke about Green Lantern is that he’s nigh-on omnipotent—but that Green Lanterns are vulnerable to anything yellow. Seriously. That’s their kryptonite: anything yellow. Bananas are deadly. So maybe I just appreciate the movie trying to make that weakness make sense. I dunno. I was never terribly invested in the characters either; the only thing I really know about Hal Jordan is that he went crazy after the Death of Superman because Brainiac destroyed his home city. I was also always confused that he was teamed up with the Green Arrow for so long: What does a nigh-on omnipotent dude gain from having a second-rate Hawkeye who shoots boxing glove arrows? Totally unclear to me. Having said all that, Blake Lively makes for a really hot brunette. So the franchise has something going for it. I’m not surprised by 1; any screenwriter who doesn’t start a Hal Jordan movie with a badass experimental flight sequence should be fired for malpractice. I’m actually annoyed by 2, if only because I assumed the reason they did so little with Sinestro was to set up for a sequel. But you’re not going to have a sequel if your first movie is terrible! Such a waste. Previous post: Julian Spalding’s “Con Art” and ‘Untitled’: a weekend double feature!